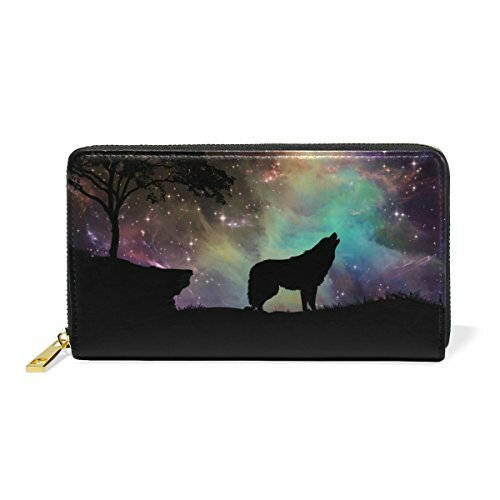 Galaxy Wolf Genuine Leather Girl Zipper Wallets Clutch Coin Phone for Women by FeiHuang at Femi Store. Hurry! Limited time offer. Offer valid only while supplies last. Specifications: - 12 Credit card slots - 3 Pocket Cash Positions - 1 Zippered pouch Color: Picture. Design: DIY color printing. Style: Australia. -- If you tired of your purse with a boring designs, our company can help you to ADD SOME VARIOUS anything you want in your life. you can GIVE ME A PICTURE and you will Enjoy the cute design and unordinary prints of this wallet. ENOUGH CAPACITY: Includes 12 Credit Card,3 Full-Pocket Cash Positions and 1 Zippered Pouch.Easily Fits Important Credit Cards or Identification etc. PERFECT SIZE: 4.13(In)W×7.48(In)H Makes Easy to Carry and Your mobilephone can be Fit into the Purse Including Samsung,iPhone 5, iPhone 6 and iPhone 7 Plus(5.5 inch). BEST MATERIALS: Two Layers of Real Leather and Premium Quality Metal Zipper for Super Durable and Easy to Use. FASHION STYLE: Practical Design Based on the Concept,DIY Color Printing.New Design Style Purse or Card Holder for You. CUSTOMIZED GIFT: Professional Personality DIY Pattern Printing Design,Custom Personalized Style as Gift to You LOVE.If You can Give Me a Picture,I Can Give You a Wallet You Want.